I said "Not"!I said NOT the usual suspects… but, then again, have you ever been Keyser Sözed? Do you ever wish to do (or have you ever done) a Keyser Söze in your story line?Take a look around you… you are a writer, or a reader, or both. What can you see that will add credence to the realities you write, or read into?Well, after two great posts from Greg and George on our blog this week, about favourite on-line writing resources, what else is there to write about? Clearly I have to come at this from another angle.It is, oh, sooooooooo difficult following others on a chosen subject!Pass me my foundation, darling…That's a cover up, then? I, too, am a fan of on-line tools such as dictionaries and a good thesaurus. And, as for Wikipedia? Well, I find it a brilliant tool, despite the limitations of knowledge validation (which are, frankly, and in my humble opinion, in some cases not without foundation). I sense my doctoral supervisors cringe at the very idea of according Wikipedia articles the status of knowledge… But, and it is a big BUT! …we are talking fiction here, and who gives a darn about the status of knowledge in fiction? All knowledge – I have commented before – starts in life as fiction. It takes a process of communication and understanding (often coupled with demonstration) for a group of people (call it a society, if you like) to come to know something as knowledge. So, someone writes something (not quite true – shall we say) in Wikipedia; some budding novelist picks up on the idea and works it into a crime novel (perhaps); some Holywood/Bollywood producer turns the novel into a film and it is seen by millions, including a budding criminal who thinks the “idea” is perfect for his (or her) next crime caper! And he (or she!) enacts the idea to commit the crime of the century. What was fiction has become truth! And a factual article is written about the “real” crime! Fiction becomes fact! Anyway, again I digress. Greg has covered Wikipedia. 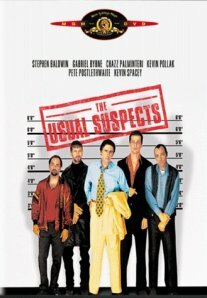 It is not until the end of the film, The Usual Suspects that we realize the narrative that Kevin Spacey has been spinning to the detectives has been based on simple “real” things that he has observed around him: the “strung-together” details taken from an office notice board, and the KOBAYASHI logo on the bottom of a coffee cup! Imagine yourself, Roger “Verbal” Kint, famous author! You are sat there – no interrogators this time – but the pressure is on! You have your computer on and a blank page to fill. At this point you have an idea, but no details. The idea? A crime! The greatest on-line resource I have found is the world-wide-web itself! Why stop at dictionaries? Why limit yourself to a certain thesaurus? Why stop at Wikipedia or Google. The same phrase entered into Google and Ask and Yahoo and… well, whatever… the same phrase will often return different results! Go on, be brave, pick and chose! Start stringing things together! This is where the fun starts… be your own Verbal reasoner. The internet (I would argue!) is the definitive resource. All the other tools are just windows on the mass of data. We chose a window to look out of, just as we might pick a favourite window to look out of a house onto the yard outside. But we sometimes forget there are other windows. Our views become restrained, we forget that when the light moves, the view changes. As a writer, I am thankful for all those people in the world out there who have given me so much material to pick and mix from. In River of Judgement, I wanted a board of directors as characters in my plot… Do you realize how many companies, world-wide, post brief bios of their directors? No? So many, in fact, that when you string things together, add new names, new locations, plot ideas etc, fact becomes embedded in new fiction and nobody is any the wiser. One might wonder where other characters in my writing come from? Well, keep wondering. That might be the subject of another post! Happy reading and writing, y’all! Two out of three… three out of three? Copyright © 2019 David Sartof, Writer. All Rights Reserved. Magazine Premium created by c.bavota.